Friday June 9th 1893 We got the ironing down in the forenoon and I sewed on Ediths skirt some. I was up town for a few moments. In the afternoon Mary Woolf was here. Hattie and Edith came and went up to see dress parade with Fanny. I went later but we all hurried home to get out of a shower. I spent the evening at home. Saturday June 10th 1893 I was busy all forenoon with the work. I went up town soon after dinner to get things for Sunday and on over home with Edith who was here for dinner. I came home before supper. Josie went over to stay all night with Agnes. Ott & Fanny went to the opera house. 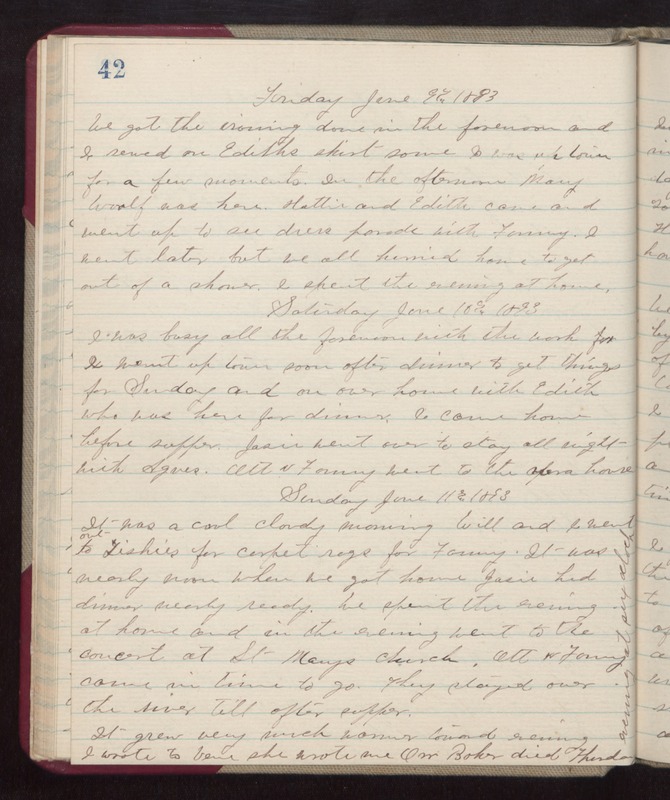 Sunday June 11th 1893 It was a cool cloudy morning. Will and I went out to Tishies for carpet rags for Fanny. It was nearly noon when we got home. Josie had dinner nearly ready. We spent the evening at home and in the evening went to the concert at St Marys church. Ott & Fanny came in time to go. They stayed over the river till after supper. It grew very much warmed toward evening. I wrote to Vene she wrote me Orr Baker died Thursday evening at six oclock.